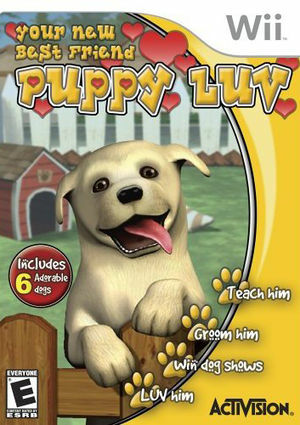 In Puppy Luv: Your New Best Friend pick out your puppy and get ready for all the fun that you will have together while taking care of your new pet! Sit, stay, roll-over, come - you name it! See if your new friend can post the best time in the obstacle course, or if he can win the dog show! Earn points at competitions and unlock even more adorable puppies! Run, play, dig for bones or take photos of your puppy to share with friends - the choice is yours. There is even a store to buy food, treats, toys and outfits for your puppy to try on! The graph below charts the compatibility with Puppy Luv: Your New Best Friend since Dolphin's 2.0 release, listing revisions only where a compatibility change occurred. This page was last edited on 13 January 2018, at 08:22.